This embroidered merman hoop will make a great gift for any mermaid fanatic, folk art fan, or lover of handmade embroidery. He is my first merman! I designed and hand-embroidered him on charcoal muslin. He is wearing a golden crown and playing a painstakingly detailed string instrument with a bow. His coiled and twisted tail is sequined with a technique inspired by Haitian folk art, each sequin is attached with a color-coordinated bead and sewn on separately by hand. The strings on the instrument and the bow are made with metallic embroidery threat. 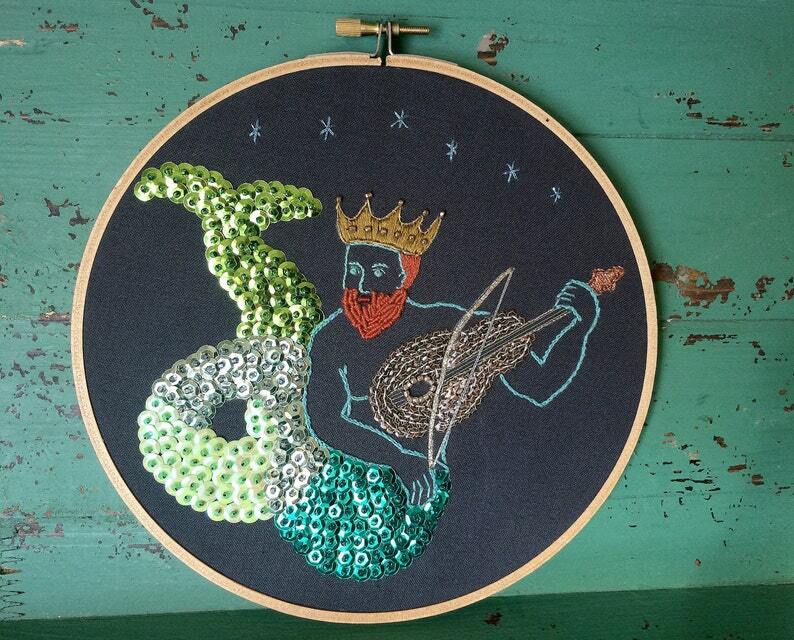 His curly beard is made using a special bullion stitch; his eyes are French knots. There are metallic blue stars above his head, showing that this is a night scene. Note: These pictures are representative and the hoop shown is not the exact one you will receive. The hoops are very similar, but since they are handmade there are some slight variations. I'd be happy to send you an exact picture of your hoop if contacted.